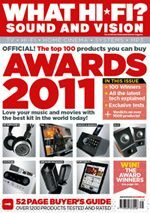 2011 Awards issue available now | What Hi-Fi? The long-awaited 2011 What Hi-Fi? Sound and Vision Awards issue, the result of a year of testing and months of heated deliberation, is available now. If you want to know the best home cinema, hi-fi, TV and computer music products to buy, look no further. Wherever you are in the world, you can download the digital version of the Awards issue right now - just click here. From the big stuff – TVs, home cinema amplifiers, speakers and hi-fi components – to those essential accessories to make the most of any system, it's all in our 2011 Awards issue, packed with new and exclusive tests and 100 Award-winners. We'll be letting you have a long hard look at our Award-winners at this weekend's Manchester Show, where you can also interrogate the review team about our choices, and you also have the chance to grab yourself a piece of the action in our now-famous 'win the winners' competition. This year we have prizes worth £15,000 up for grabs. Plus in the Awards issue there's another great competition with a fabulous system, worth almost £5000, to be won from one of the most famous names in audio. Want more Awards-related stuff? Click here, and you'll be transported to our dedicated Awards section of the site, where all the winners will be revealed and you can read (and watch) the thinking behind our verdicts.